Tim and Ashley had a beautiful wedding at the Ritz Carlton Grande Lakes, in Orlando. Surrounded by family and friends they strolled down the aisle on the lawn of the Ritz to the cheers of their family and friends. As the sun began to set they vowed their love to each other, exchanged wedding rings, and became husband and wife. Brandee with Blush by Brandee Gaar coordinated this simple, yet beautiful wedding and reception. She took the couple’s vision for their wedding day and put together a team to make it all come to reality. 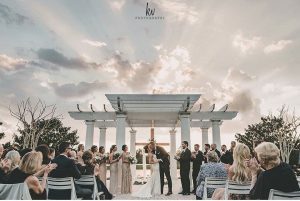 KV Photography captured every moment of the wedding day. From the bridal party getting ready, through the ceremony, family shots, and cocktail hour, to the luxurious reception. Lee James Floral did an amazing job crafting the beautiful florals that adorned the gazebo of the Ritz, the flowers for the bridal party, and the incredible centerpieces at the cocktail hour and reception. Al Dee Productions keep the music flowing throughout the evening and kept the couple and their guests on the dance floor until the very end of the night. Rev.Glynn Ferguson with the Sensational Ceremonies team of wedding officiants, worked with the couple to create a custom ceremony that fit the two of them. He gave them a homework assignment to write and say why they love each other. Ashley wrote: The moment we met, I knew you were special. I was immediately attracted to your infectious personality – you’d 6’5 stature, blonde hair and blue eyes may have also had an impact! It didn’t take long for me to recognize you have a heart of gold I was quickly falling head over heels in love with you. As the years went on I have come to love and appreciate so much about you. In a world full of “me” people, I think God every day that I found someone who puts the needs of others before his own. Your loyalty to me, Kelly, your family and friends is a quality I not only love, but admire. While there is so much to love about you, watching you father Kelly has taken my love to a new level. You are the type of father and partner I have always dreamed about. Today marks the beginning of our life as husband and wife – I love you more today than when we met and I will love you more in 50 years than I do now. It’s official, I GOT BURKED! Tim wrote: You changed my life from the moment I saw you. Your beauty had me from the start, but through this journey your compassion, selflessness, patience, and motherly touch is why I could never spend a day without you. Our life together is just beginning and with you by my side I know I will be the best version of myself and everything you want, need, and expect from a husband. Your love, your happiness, and your genuine heart for others makes you the person you are and why I love you so much. I truly have out kicked my coverage. You are not just but quarterback but the quarterback for this family. Kelly and I are so lucky to have you. I love you. We wish them happiness for a lifetime.